When it comes to home security basics sensors and monitoring are two of the most important components you should know about.. In this article we’ll dive into what you need to know about Interactive security monitoring systems what to look for, how to setup, the various components and a brief summary. What Is An Interactive Security Monitoring System? One of the advantages most good home security system companies can offer you today is an interactive monitoring system. Basically what this does is allow you to access your system remotely – from the Internet, smart phone or your tablet. You’ll be able to not only control the arming and disarming of your system, but you’ll be able to see real-time activity on your system, as well as a logged history. So, for example, if you’re on vacation but the housekeeper has a key and is supposed to come every other day, you’ll be able to see exactly when she enters the house and leaves, and depending on the motion sensors you have installed, where she is in your house. Who Provides the Interactive Monitoring Service? The most well known interactive monitoring service provider is Alarm.com. They were founded in early 2000, based on the principle that they wanted more control over their own security system. They grew quickly as demand for their service climbed, to the point that they stopped accepting customers directly. Today, you can get interactive monitoring service for your home security system by Alarm.com for most security companies that use GE wireless equipment. You can visit Alarm.com’s FAQ (Frequently Asked Questions) for more details. Your home security system provider may even provide security cameras, which you’ll then be able to view and monitor via your interactive monitoring service. These can also be used as a great tool to keep an eye on your pets while you are away. What’s are the Type of Sensors and what is Recommended for Basic Setup? Hard wired – hard wired systems are installed inside your walls with actual wiring rather than a wireless system which involves no wiring. These wires runs between the sensors and the control panel. A hard-wired alarm system will be difficult for the average homeowner to self-install. It will also be time-consuming to find the right “alarm guy” to do the installation for you. But there are many competent alarm professionals out there, if you’re willing to invest the time to seek them out in your own community. Wireless – in a wireless system the components (sensors) of your system are wireless, as opposed to being hard-wired into your home. Wireless alarm sensors ‘run over’ a RF radio network to communicate to the alarm control panel. Typically, a wireless system can be installed by yourself, whereas a hard-wired system will need a professional installer. In addition, wireless systems can be moved more easily (and usually without a fee, since you do it yourself) when you move to a new location, whereas a hard-wired system will either carry a moving fee, or, in some cases, require you to purchase new equipment. 100% Wireless – More important, and this is often missed, is that you are on a 100% wireless system. What does this mean? It means the connection between both your sensors and control panel, as well as control panel and monitoring station, are all wireless. Our research indicates that Frontpoint Point Security (FPS) is one of the only alarm providers that offers this technology by default (many providers that claim to offer wireless offer only a wireless connection between the sensors and control panel, which is not nearly as essential as a wireless and cellular connection to your monitoring station). And others don’t actively market this technology because it impacts their margins. Cable (broadband) – cable alarm systems use your Internet connection. While these may be slightly more secure than land lines, the cables can still be cut, and there is always the possibility, while small, of an Internet outage interrupting your service. For this reason, with cable security systems it’s recommended that you add battery backup. Dedicated Cellular – a cellular system, while slightly more expensive, is also our recommended type of security system setup. Why? Because it uses a dedicated two-way cellular network (not the same network your phone uses – no worries of “dropped” calls here), not land lines or internet connections that are susceptible to a burglar potentially cutting them to take your communication path offline. Battery Backup – Make sure your control panel also has battery backup – so if you lose your power, your security system stays online. If not battery backup, make sure there is some sort of communication backup so there is never a risk of your system not communicating with the monitoring station in case of emergency. Smash and Grab Protection – When your house alarm goes off, a signal is sent, and when you disarm, a second signal is sent. If the second signal is never received (i.e. if a thief trashes your security system control panel), then authorities are dispatched. Now that you have an idea of what types of home security systems are on the market, it’s time to look into the actual components (sensors, etc.) for your house alarm setup. Note that, at a minimum, you’ll need a control panel (for communicating with your alarm system provider and monitoring station) and door sensors (so a break-in can be detected). In most situations you’ll also want to install at least one motion sensor. 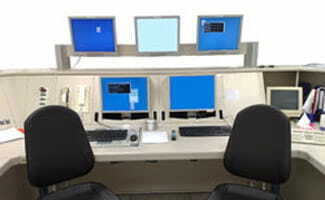 Control panel – a control panel is the brains behind your security system. It’s used to communicate with your alarm system provider as well as your monitoring station. You’ll install one control panel in your home, but may install multiple keypads to interact with your control panels depending on the size of your house, and the different entry points you use to gain access to your home. Alarm system control buttons – every control panel will come with arm and disarm buttons. When disarming, you’ll be asked for a unique PIN code to enter that will enable you to disarm the system. Typically, your system will also have entry and exit delays allowing you a fixed amount of time (typically 30 seconds to 1 minute) to enter and leave the home before the system is armed (upon leaving) or an alarm is sounded (upon entering and failing to disarm). You’ll also be able to select a stay (arm doors and windows for sleeping at night) or away (arm all sensors as you leave the home) arming mode. Status buttons – some control panels will let you see a history of events that have been triggered, such as door and window openings, motion sensors being tripped, and of course, actual alarm events. Emergency buttons – control panels may include one press emergency buttons that will put you in touch with the local authorities, or send them out to your home, as quickly as possible. These include police, medical, and fire. 2-way calling – some control panels and alarm system setups will be configured to allow two-way calling with your alarm company. This will allow you to speak to your security system provider without picking up the phone. Door and window sensors – a typical setup will include door sensors for your exterior doors, as well as several window sensors. Usually these are the same type of sensor – they simply attach a transmitter to your door or window frame and a magnet to the door or window itself, so the alarm can detect if the door or window is opened. Note that these these sensors will not detect glass breaks. See the glass break sensors below for more info. Motion sensors – motion sensors usually detect motion based on body heat in a 90 degree angle up to 45 feet away. Every company’s motion sensors differ, so it is best to read your specific instructions for your system to insure maximum coverage. The optimal place to install your motion sensor is in a corner, so the 90 degrees of coverage run along each wall, effectively covering the maximum amount of space. There are very few motion detectors which actually throw out a 90 degree area of coverage, as you claim. However, there will still be blind spots along the edges of the walls if the motion detector is installed in a 90 degree corner. Motion detectors have difficulty detecting someone walking along, or “stuck to”, the side walls, especially at greater distances from the motion detector. Motion detectors take a longer time to react to someone walking in a straight line directly towards the motion detector’s lens; motion detectors are best suited to detecting movement made across the room, parallel to the lens. So, again, follow the advice of your specific system to get the maximum coverage. Additionally, it helps to install motion sensors at a height between 7 and 8 feet above the ground. Alternatively, you can install them between the wall and ceiling, pointing downwards at an angle to cover the room (this type of setup will typically involve screws, or a semi-permanent installation). If you are concerned about “ground motion” there are models with “look-down lens” designed to detect motion in the typical “dead-spot” directly underneath the motion detector. Pet-proof motion detectors require a minimum of six feet between the motion detector and the animal to be effective so base your height placement on the height of your dog at his tallest point when standing or jumping, depending on his temperament. Note that motion sensors can be used in lieu of window sensors – as you’ll be able to cover several windows with one motion sensor. The drawback to this approach is that if you arm your system in “stay” mode, typically only the door and window sensors will be armed. Another thing to keep in mind with motion sensors is that, depending on the weight of your pet (dog, for example), your pets might be able to trip your motion sensor. Ask your security representative about the specifics of your motion sensors and what they recommend. Typically, you should be able to confine your pets to areas that are not covered by your motion sensors while you are away. Glass break sensors – glass break sensors should be installed if you have large sliding glass doors, large windows, or simply want additional protection in the event that a thief enters your house by breaking the glass instead of opening the window. A glass break sensor will detect the unique frequency of glass breaking, usually up to 10 feet away – so you should be able to install one to cover at least two windows. Note that glass break sensors will not detect windows opening if the glass doesn’t break (just as window sensors will not detect glass breaking). For a full solution, you’ll need either both window and glass break sensor (for a window), or (we prefer this) a motion sensor to cover the area. Note that glass break sensors will sound an alarm if glass is broken, whether or not your system is armed. The idea being that glass shouldn’t be breaking at any time, whether your system is armed or not. This will only work if you or a security professional programs the alarm zone for the glass breakage detector as a 24-hour zone. Otherwise the glass breakage detector will only sound the siren(s) when the alarm panel is armed. Security cameras – security cameras can be installed indoors and outdoors. You can combine them with interactive monitoring to keep an eye on your pets while you are gone; or to record video or your premises which can help law enforcement track down potential criminals or trespassers. There are two basic ways of arming your home security system: Stay (or “home”) and Away. In Stay mode, the system assumes that you are home, and typically this will mean that motion sensors are disabled. In Away mode, the system assumes that you are out of the house, and will therefore enable all sensors. Note that glass break sensors are typically enabled at all times, even when your system is disarmed. After all, you typically don’t enter your home by breaking in through the window, right? These are things to keep in mind as you decide on which components (sensors) to add to your system, and how many of each to add. As we pointed out, you can use motion sensors to cover large areas, including areas that normally might require a series of window sensors. However, if you arm your system in Stay mode, the motion sensors typically won’t arm. You can always, of course, arm the system in Away mode when you’re at home, but keep in mind that you’ll want to keep yourself (and your family members and pets) away from the motion sensors so they don’t get tripped. A central monitoring station is what your home security system is connected to for action in times of emergency. These are the people that are monitoring the activity in your home when your house is armed, and that will contact you and dispatch the authorities in the event of a break-in, fire or other emergency detected by your alarm system. Lots of the top alarm companies will go on and on about the number and quality of central monitoring stations (the station that takes your alarm alert and passes it to local authorities), and the inferiority of central monitoring stations other companies use. Some have more than one station which they will tout as more reliable than one monitoring station as well. Some even have their own monitoring services in-house. The bottom line is that you want an alarm company that doesn’t simply have a good central monitoring station, but does a good job of installing your system to your needs (or in the case of a self-install, helps guide you through the process), answers your security questions, and makes you feel comfortable with the service you are buying. You want your alarm system setup correctly and with adequate security measures (i.e. doesn’t allow cut phone lines) to begin with then you can research the reliability of the monitoring station they use and how has it performed for others in time of need. Then you can make a good decision for you. Good Customer service – Make sure they can answer your questions and address your specific needs (as opposed to theirs, and simply making money). Customer Reviews – Do in-depth research to find out if your home security provider is getting good consumer reviews. In particular, it’s important to keep in mind that with larger home security providers (such as ADT, Brinks, etc. ), reviews will often be targeted at local authorized dealers, which means reviews will vary greatly depending on geographic location. 100% Wireless System – We recommend you invest in a security system that is 100% wireless in the home for added flexibility but if you have an existing wired system, many home alarm companies can work with you to adapt your system to work with their newer technology. Interactive Monitoring – It’s a huge plus to be able to keep track of everything that’s happening at home, while you are away. You can also use interactive monitoring to remotely turn off and on lights to make your home looked more lived in when you are away (if you have opted/set up this service) and you can even disarm your house’s alarm system. Cellular Communication to the Monitoring Station – A system that uses a dedicated cellular communication line to transmit any emergency from your home to the offsite central monitoring station paired with another form of backup communication (battery, broadband, etc.). Reliable and Respected Company – Do your research and be sure to choose a reliable, well known company with a central monitoring station that’s not run out of someone’s garage. This is a highly segmented industry with lots of local players so you need to be sure you find a company who has a good reputation before you sign a contract. Why Install a Home Security System in the First Place? Crime is on the rise, and for a small monthly fee you can give yourself and your family peace of mind. That being said, we’re also in hard economic times, and money is tight. So, if you can’t afford a home security system, at least buy a house alarm sign and stick it in your front yard. According to statistics, that will deter 60% of burglars on its own. If you’re worried that someone might not see the sign, or you need one in your backyard as well, order multiple. Burglary stats suggest that 85% of break-ins happen through doors, not windows. But most home security system providers will provide you with window decals as well (or, you can order some yourself) as an added deterrent. For several years we have been conducting annual reviews of home alarm companies and their security system offerings. You can view the winners of our coveted awards on our best home security systems page, and read more about our review process on our article that explains how we pick our winners. One thing that helps security companies such as Frontpoint, Protect America, SimpliSafe, LifeShield, and some of the other smaller outfits grow and adapt to an ever-increasingly sophisticated criminal environment is their focus on DIY (Do it YourSelf) alarm systems. The time and money that traditional companies would spend on the installation process is saved by these DIY players and it allows them to focus their efforts on researching and developing new sensors and systems, and making sure all parts of the system are using the latest and most reliable components. They can also spend more time staffing and training customer service personnel – time that is typically spent on sales people and installers by the larger security firms.